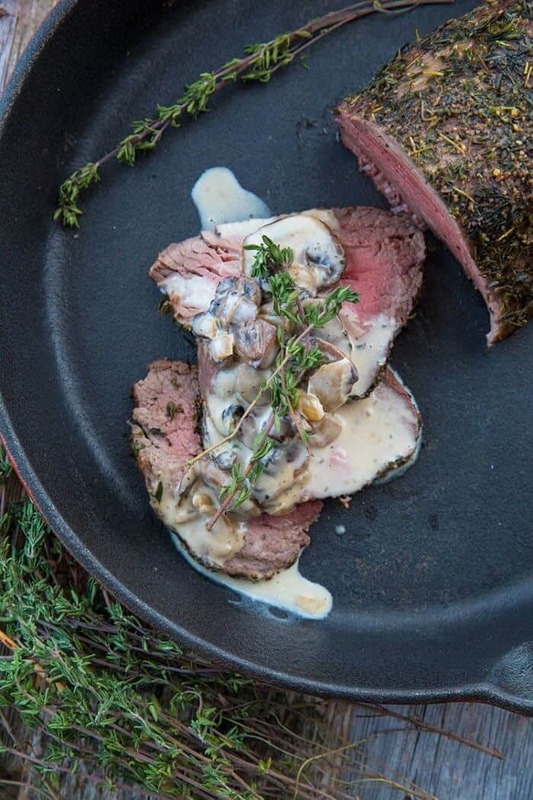 This Skillet Beef Tenderloin Roast au Poivre & Mushrooms takes the classic French Steak au Poivre and uses a pepper and salt encrusted tenderloin roast instead. Dare I say it’s even better than the classic? I dare. We served this to company for Sunday supper and it received rave reviews. Beef Tenderloin Roast au Poivre – A New Twist on an Old Classic! Steak au poivre (pepper steak) is a French cuisine classic. 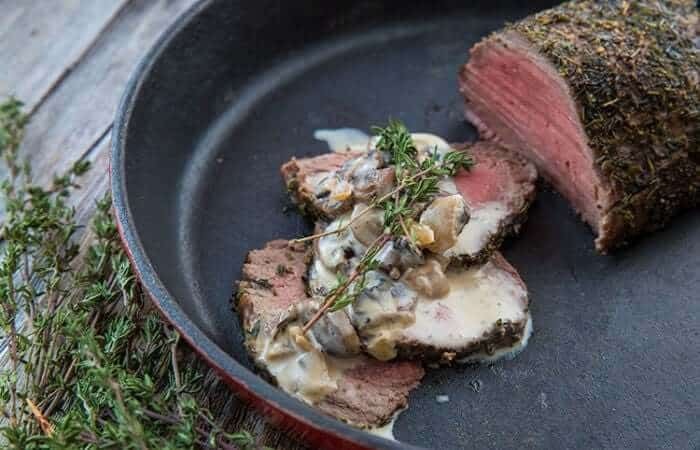 Traditionally you cover filet mignon in cracked peppercorns, fry them in a pan and then make a cognac cream sauce. I wanted to riff on the classic dish and use a Sterling Premium Meats Tenderloin Roast instead. As my last recipe of three from my partnership with Sterling Silver® Premium Meats I wanted to try something different and cook a premium roast with a sauce that wasn’t gravy. Sterling Premium Beef is carefully sourced from the North American Great Plains and hand-selected for optimal quality so that when you purchase one of their roasts, you are cooking the best roast beef you possibly can. I knew that this tenderloin was going to roast up to be fork-tender and I would be able to cut through it like butter. 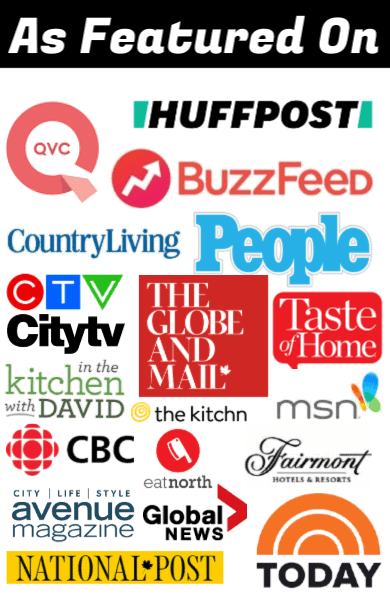 What Cut is Beef Tenderloin? Tenderloin is (as the name suggests) the most tender cut of beef. If you have eaten T-Bone steaks, you have eaten tenderloin. When it’s cut into T-bones, the tenderloin is on one side and the strip/top loin steak is on the other. The best way to enjoy tenderloin in my opinion is to go all out and purchase a tenderloin roast. No bones, no other cuts, just pure tenderloin. The best way to cook a tenderloin is to not overcook it. You lose all of the tenderness if you cook it to well-done (and I know that there are some well-done roast beef fans out there) but to reap the benefits of this prime cut of beef, try not to cook it until dry. Measure the roast with a proper meat thermometer in the middle of the roast for an accurate temperature reading. The herb rub on this roast is excellent by itself, if you are looking for something without a sauce. But boy oh boy, can we talk about that cognac mushroom cream sauce for a second? It was the perfect foil to the peppery bite on the outside of the roast and turned this into a dish that impresses beyond belief. Your guests or family will never guess how easy this is to make! Happy cooking! Let me know in the comments below if you have any questions! 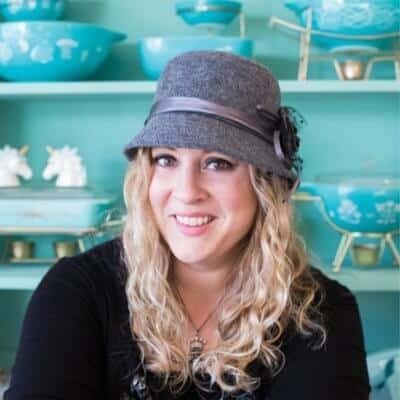 Pin This To Your Dinner Ideas Boards and Remember to FOLLOW ME ON PINTEREST! 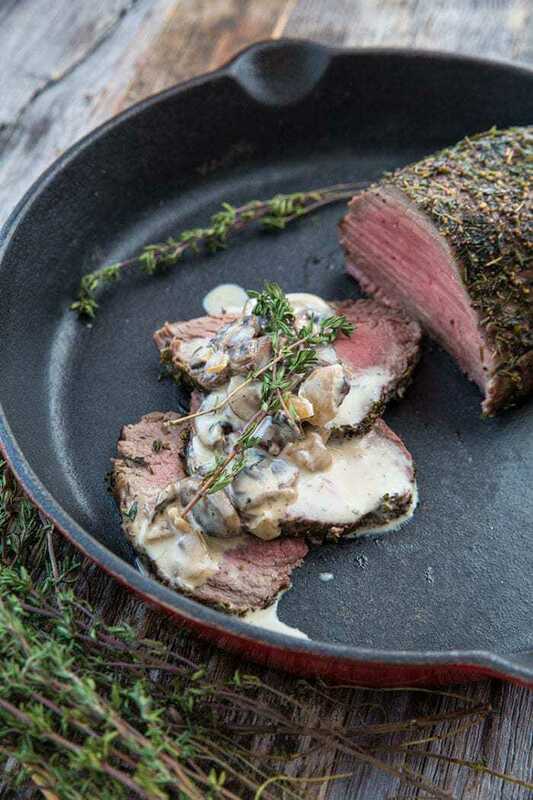 This Beef Tenderloin Roast au Poivre & Mushrooms takes the classic French Steak au Poivre and uses a pepper and salt encrusted tenderloin roast instead. Combine the oil, pepper, thyme and salt together to form a paste. Pat the tenderloin roast dry, then apply the paste in a even layer on top of the roast and down the sides. Place in a skillet. Cook the tenderloin roast until it is ten degrees before your desired internal temperature. ( example, if you want medium rare at 135 °F, then remove the roast when the thermometer reads 125 °F. Remove the roast, place it on a plate and tent it with tinfoil. Using oven mitts as the skillet is hot, place it on the stove. Over medium heat, melt the butter and mix with the drippings from the roast. Add in the shallot and fry for 4-5 minutes. Add in the mushrooms and continue to fry with the shallots. Fry until the scallions are soft and tender and the mushrooms have reduced in size and are fully cooked. Add the cognac in and fry for another 2-3 minutes, letting it soak into the mushrooms and evaporate slightly. Scrape the bottom of the skillet, using the cognac to deglaze it. Stir in the cream and heat. Slice the tenderloin roast into disks. Top with the cognac mushroom sauce and serve.